This quartet session from 1965, has long been considered one of Wayne's finest studio albums, even though it remained unreleased until 1980. 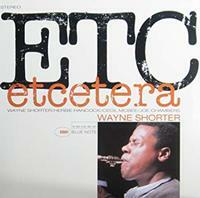 Etcetera features all Shorter compositions, with the exception of Gil Evan's passionate "Barracudas." Wayne's "Indian Song" takes its place as one of Shorter's most intensely hypnotizing compositions. Etcetera is one of the true highlights of the Shorter discography. Extreme attention to detail has been paid to getting these right in every conceivable way, from the jacket graphics and printing quality to superior LP mastering (direct from the master tapes) by Kevin Gray to superb 180-gram audiophile LP pressings by Record Technology Inc. Every aspect of these Blue Note/Tone Poet releases is done to the highest possible standard. It means that you will never find a superior version. This is IT.